UNITED NATIONS, February 24 -- The (re) launch of UN Women Thursday night in the General Assembly drew more photographers than reporters. The agency has already existed for two months. Still, attendees of the Commission on the Status of Women were excited, and cheered speeches by, among others, Nigeria's Ambassador Joy Ogwu and UN Women chief Michele Bachelet. Afterward Bachelet took three questions from the press. She dodged a question about Chile, where she used to be President. Inner City Press asked her about Libya being on the board of UN Women, and what if anything she has accomplished in two months on the immunity of UN peacekeepers when they commit sexual abuse or exploitation while on mission. Bachelet said that all 41 countries on UN Women's board have been helpful - a strange answer given the belated mobilization of the UN system on the violence in Libya. Afterwards it was remarked, if one wants to become Secretary General, you can't duck questions on a topic like Libya today. Bachelet gave a multi-part answer on peacekeeping, including training women mediators. But on immunity, which leads to impunity, nothing. We'll keep asking. While UN Women is mostly a consolidation of the UN's pre-existing women's programs, it has units like one researching the rights and plight of expatriate domestic workers. It is a work in progress. The event began with the announcement that Christiane Amanpour could not be present, replaced by Ju Ju Chang. Ju Ju described Mrs. Ban as a good woman behind her man -- groan -- and introduced an activist from Nepal. Qatar is opposed by Nepal for the next President of the General Assembly post. Most say that Qatar's money will win the day. So it goes at the UN. Footnote: the mood is energetic at the UN, it must be said. Inner City Press spoke with a CSW delegate who last visited the UN 40 years ago, very happy to see the GA again. People ask strangers to take their picture. The UN has a lot of social capital, but persists in wasting it. UNITED NATIONS, February 22 -- As questions mount about the UN's coddling of dictators in the Middle East and North Africa, Secretary General Ban Ki-moon and his spokesman have claimed that the UN, through the UN Development Program and its Human Development Report, have been criticizing the region's lack of democracy for years. Click here for UN's February 17 answer to Inner City Press. But the UN system's coordinator for Libya, UNDP official Costanza Farina, has in fact been praising Gadhafi's regime. She has said, “''Libya has made immense progress and is well positioned among the countries that will be able to say that they have reached 8 of the Millennium Objectives in 2015.” And click here, 2010 "UNIC Tripoli organizes Reception at UN House in celebration of UN Day." As of February 22, UNDP Libya had a blank press release page. Inner City Press: People that look at it and have seen that it was updated all the way, until suddenly there was turmoil in the country and then it is not updated any more. What’s the role, according to the Secretary-General, of the existing UN programmes in countries like Libya and Yemen, where Helen Clark visited and didn’t say anything about democracy? 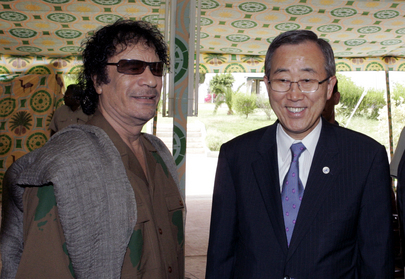 UN's Ban & Gadhafi, MDG and woman's right praise not shown- erased? 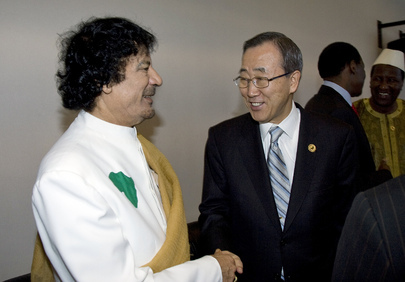 What have the UN and UNDP been saying about Gadhafi, other than praising MDG achievements and women's rights in Libya? Watch this site.